Cucumber | Shneor Seed Co. Suitable for spring and summer crop. 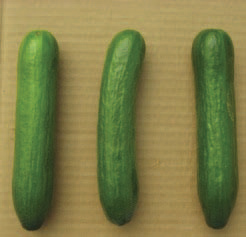 Intermediate resistance (IR) to Cucumber Mosaic Virus (CMV), Cucumber Vein Yellow Virus (CVYV) and Powdery mildew (Px). With remarkable yield and good fruit quality. Plant is vigorous with short internodes, early maturity and parthenocarpic flowering. Fruit size is 30-35 cm long, cylindrical shape and very uniform weight: 300-350 gr. 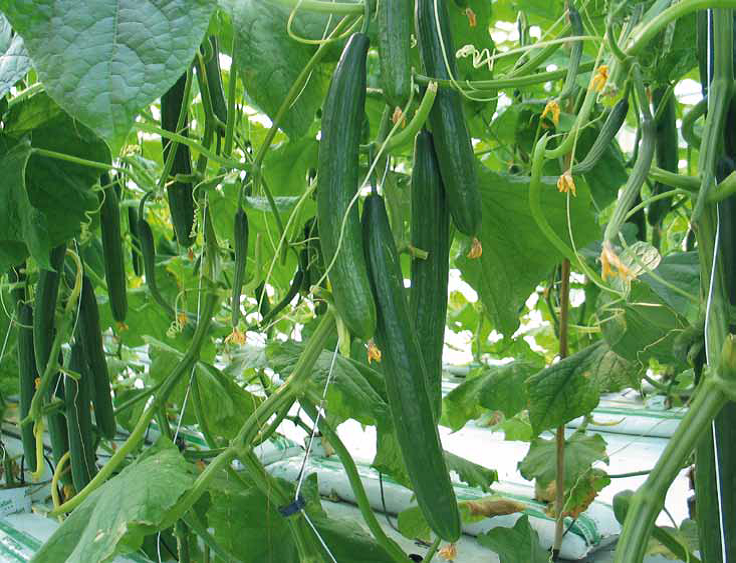 For greenhouse cultivation for late autumn and winter crop. Gynoecious parthenocarpic flowering. Fruit shape: Cylindrical shape, wrinkle skin, very dark green color. Fruit size: 16-18 cm in length. Early cycle, very good vigorous plant. Resistances: IR: Px. Open plant, dark green. Size: 10-12 cm. High tolerance to : CMV, CYMV. Very productive plant, very uniform fruits. 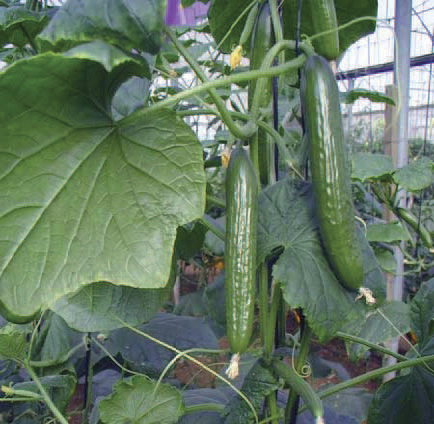 New Parthenocarpic Cucumber for greenhouse Dutch type Good color and shape. Uniform and regular fruits. Strong plant. 30-35 cm in length. Hybrid f1,new slicy type,parthenocarpic cucumber. vigorous plant, tolerant to diseases and productive, very early,17-20cm in length, dull rounds ends, dark green color, resistant to CMV,PRSV-W,WMV-2 and ZYMV. 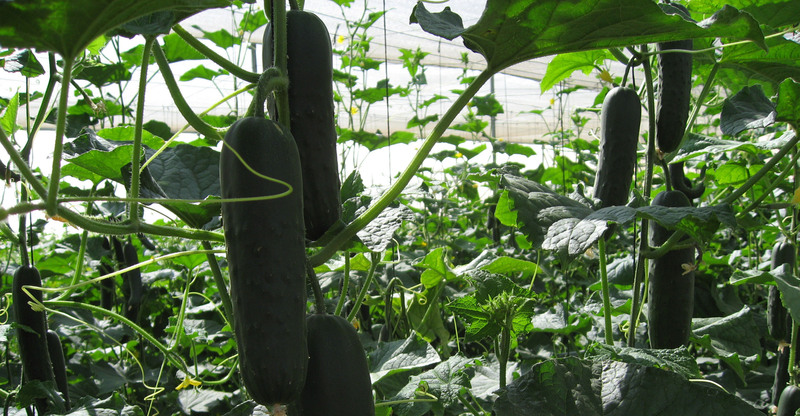 suitable for greenhouse and nethouse ,long shelf life. Long season variety. 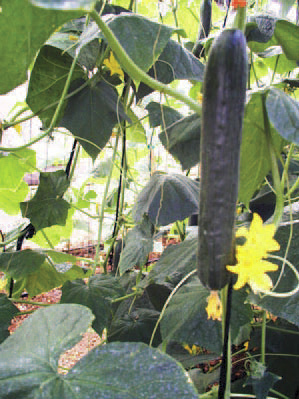 Suitable for greenhouse and low tunnels Suitable for late autumn and winter planting. Plant is vigorous and has continuous yeilding. Fruit is uniform shaped, dark green color, glossy. Fruit length is 16-18 cm. Resistant to F1. 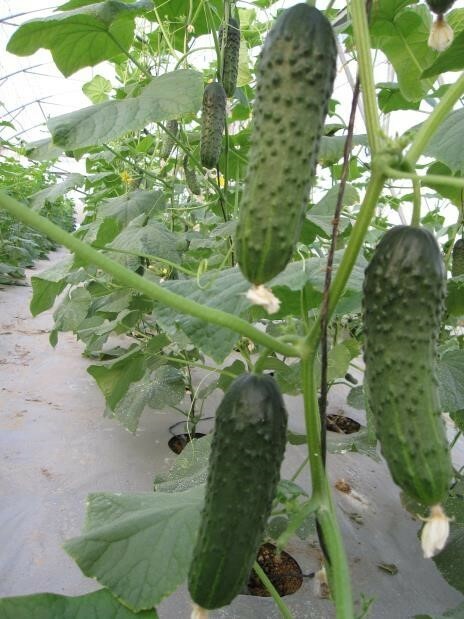 New, Dutch type Parthenocarpic Cucumber for greenhouse. Vigorous and open plant. Fruit has medium green color and has ribbed texture. Can be grown in warm climates. It also performs very well under cold stress conditions in winter crops. It is strong against burnt heads. It has long shelf life. Hybrid F1 - Outdoor variety. Very strong plant with very few lateral shoots. Early, can be harvested 47 days from sowing. Fruit weighs 500-700 gr. It is uniform in size, 25 cm long x 6 cm wide, rounded ends, straight. Skin color is nice, uniform shaped, and with steady dark-green color. Suitable for open field. Good for storage and shipping. Easy to harvest. Resistant to CMV, PRSV-W, WMV-2, ZYMV and Mildews. Hybrid f1,slicy type parthenocarpic cucunber. Hybrid F1 - Greenhouse and low tunnels variety. Long season variety. Suitable for late autumn and winter planting. Plant is vigorous and has continuous yeilding. Fruit is uniform, rounded ends, strong and straight shaped, dark green color, glossy. Fruit length is 16-18 cm. Resistant to F1. Suitable for all open fields production season. Good setting under low temperature. Vigorous plant, early and with very high yield. 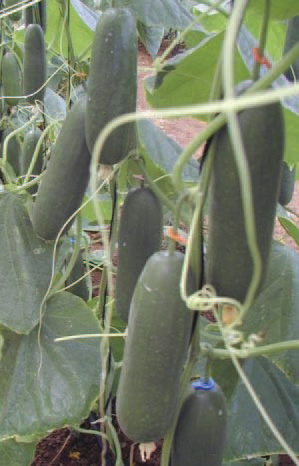 Strong and uniform fruit, dark green color, 16-18 cm in length. Resistant to CMV. Plant type short season variety, vigorous. 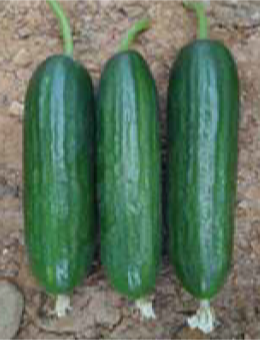 Relative maturity: early with a very high yield.Fruit size:15-17 cm in length ,Fruit shape: uniform, rounded ends,strong and straight.Skin color: attractive green to dark green color.High tolerance to PM, DM.Suitable for greenhouse and low tunnel planting, appropiate for planting in early spring. 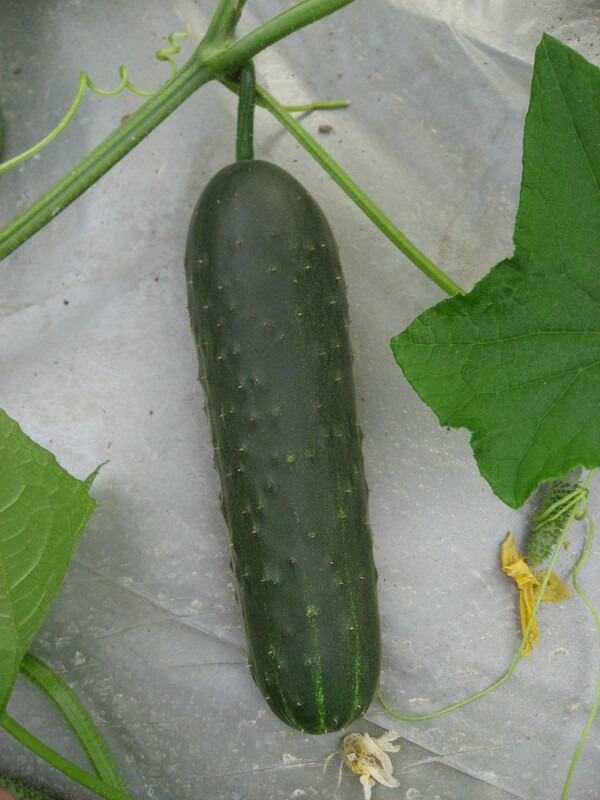 Type:Parthenocarpic Cucumber; Plant:Short season variety,Vigorous plant, early and with very high yield; Fruit shape & size:Uniform in size, 15-17 cm in length, Rounded ends, strong and straight; Skin color:Attractive green to dark green color; Disease resistance:Resistant to PM, CMV,Tolerant to DM; Features:Suitable for greenhouse and low tunnels planting,Suitable for spring, summer and earlautumn. 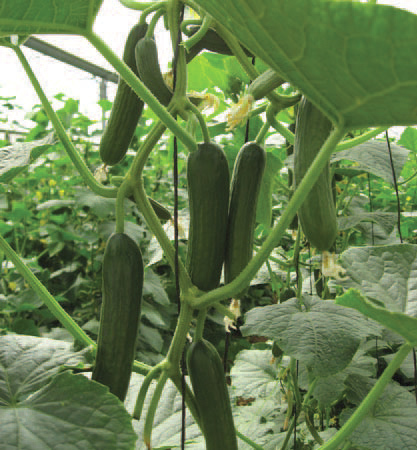 Vigorous plant, tolerant to diseases and productive.Relative maturity: very early.Fruit size: 17-20 cm in length Fruit shape: dull rounds ends.Skin color:dark green.Suitable for greenhouse and nethouse, long shelf life. Parthenocarpic type. Vigorous plant, with continuous yielding. Suitable for greenhouse and low tunnels planting. Fruit color: Shiny green color. Shape & size: Uniform in size, 10cm in length, rounded ends, strong and straight. Resistances: high tolerance to PM, DM. 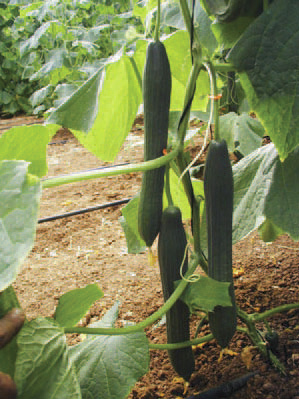 Long season variety, Vigorous plant, with continuous yielding. Suitable for greenhouse and low tunnels planting. Suitable for all Year planting. 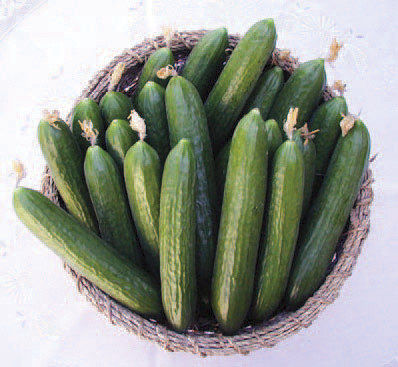 Fruit shape & size: Uniform in size, 16-18 cm in length, rounded ends, strong and straight. Skin color: Dark green color, glossy. Strong resistance to PM. Resistaces: DM, VMV and high tolerance to heat. Parthenocarpic beith alpha type. Plant is vigorous, with early cycle and multi-pistillate flowering which ensure 2-3 fruits at each internodes. 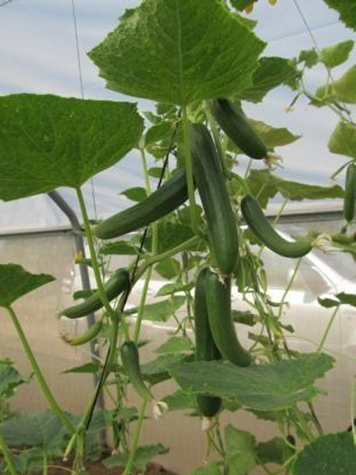 Recommended for greenhouse cultivation on spring and early autumn crop. Fruits are uniform, cylindrical shaped with size 16 ° 18 * 4 cm with evident stripes. Fruit color: deep green, bright and glossy. 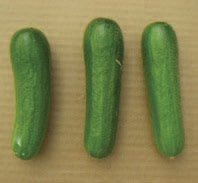 Intermediate resistance (IR) to Cucumber Vein Yellow Virus (CVYV), Corynespora cassiicola and Powdery mildew (Px).